Also known as bearcats (and affectionately called bintys), they are curious animals that belong to the civet family, are mostly nocturnal, and can live as long as 18 years! They spend most of their time in trees, climbing with the help of their large claws and fully prehensile tails. Weighing up to 45 pounds, they feed primarily on fruit, but will also prey on a variety of small animals and insects. Heavily hunted for their meat and fur, they are classified as Vulnerable on the IUCN Red List and have become increasingly rare in Cambodia. Pote Leen is a beautiful animal called a Binturong, which are affectionately called Binty’s and who’s natural scent reminds us of popcorn! They are rescued from the fur, pet and bush meat trades in Cambodia. We have a successful breeding program at Phnom Tamao and Pote Leen has been the proud father of several litters! We have released and tracked one family at our Wildlife Release Station in Koh Kong and will continue to release suitable families to help bolster native populations and prevent these unique animals from becoming endangered. Through outreach and education, Wildlife Alliance is working to raise awareness about the threats facing this unique species. Join us on Facebook, Twitter, and Instagram and help us raise awareness about the pet and fur trade with your friends. 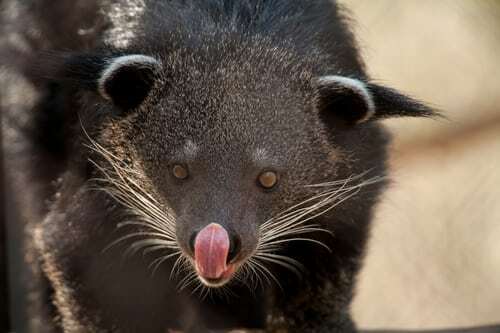 With your help, we hope to release binturongs from our breeding program into Angkor Forest. Donate to our Angkor Wildlife Release Project to help build a release enclosure, and supply camera traps and radio collars. Help bring binturongs back to Angkor!